June 29, 2016 by Ecommerce News. About Mobile with tags The United Kingdom. 10106 views. Ecommerce in the UK is set to reach 81 billion euros in 2016, partly due to an impressive growth in smartphone-based buying. Mobile ecommerce is expected to be worth 30 billion euros this year, which is an increase of more than 25 percent compared to last year. 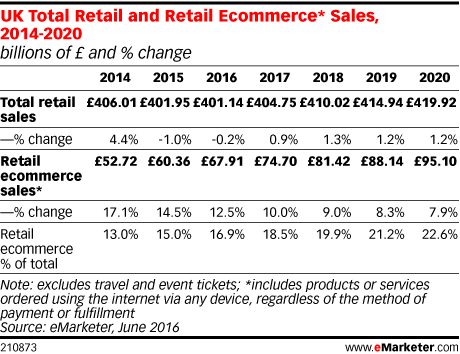 The expectations about the ecommerce and mcommerce industry in the United Kingdom come from eMarketer’s latest forecast. 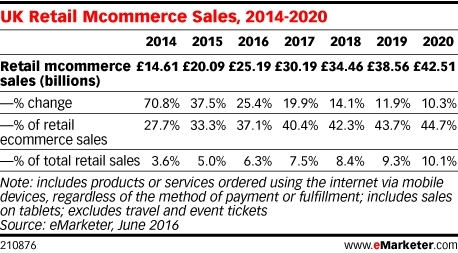 The growing ecommerce in the UK would help to offset a decline in traditional retail sales. The total retail industry showed negative growth last year but it’s set to grow by 0.9 percent next year. Emarketer thinks ecommerce will account for 22.6 percent of total retail sales in the UK by 2020. This would make the European country a world leader in terms of ecommerce’s share of total retail sales. This year, expectations are mobile commerce sales will account for 30.48 billion euros, an increase of more than 25 percent. This industry will continue to show double-digit growth for the next couple of years, and by 2020 mcommerce is expected to exceed 51.4 billion euros. Most of the mcommerce sales in the United Kingdom come from tablets. 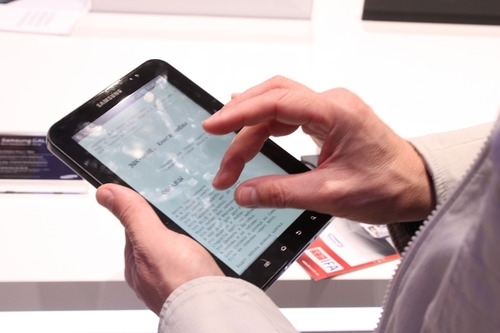 This year, about 19.1 billion euros was spent via tablets, thereby representing more than 62 percent of all mcommerce sales. But that’s not to say the smartphone doesn’t play a role, shopping via a mobile telephone is quickly gaining ground. It now accounts for 36.4 percent of all mcommerce spending in the UK, but by 2020 its share will grow to 52 percent and sales of 26.7 billion euros. Note: On Ecommerce News, we write our articles in euros. The source of the article above used pound sterling. We converted all £ prices in € prices, using the current exchange rate (1 British pound = 1.20 Euros).